Healthy Estuaries – I am interested in keeping our Oceans and Estuaries healthy for future generations. I noticed this wrack pile full of microplastics during an exercise walk in December 2017 at the foot of the Vilano bridge. Probably deposited there during the storms last fall. It’s a reminder to me how much plastic is in the ocean that the general public doesn’t know about. These wrack lines full of plastic are in constant movements from the ever changing tides. It’s slowly getting noticed by many concerned citizens and biologist. This isn’t just irresponsible littering. This is a result of decades of massive amounts of plastic use. The plastic at this site has been in the environment for years. It is broken down to those small pieces by the sun’s uv rays and wave action. It circles around in the North Atlantic Gyre until deposited in a capturing area during high tides and storms. Click here for additional photos. On Saturday, I beached on the west side of Anastasia State Park near the jetties at the south side of the inlet. My husband and I kayaked from the Lighthouse in Salt Run. When I took a walk around the inlet to the beach, I found lots of microplastics. These plastics have been there for years in the high dunes and old storm wrack lines. Hurricane Matthew has caused loss of the dunes and left behind a huge amount of microplastics. It’s now scattered in the sand for the next high tides to wash back out to sea. Below is a link to the beauty of the inlet without seeing its dirty secret that scatters the beach near it. 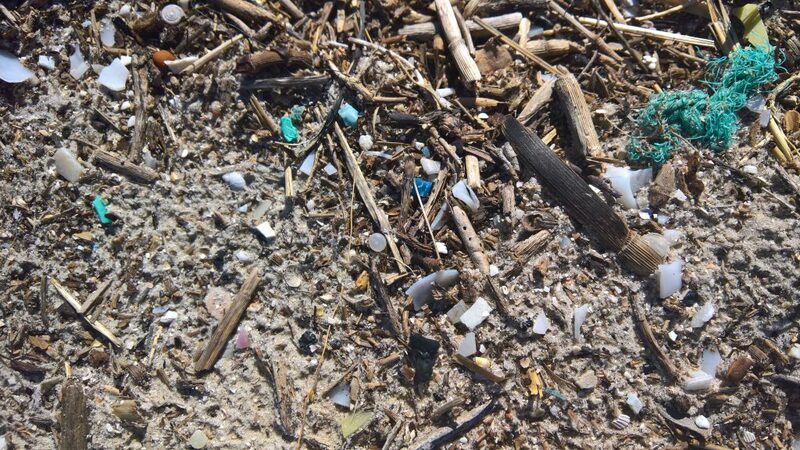 These tiny plastics are often not noticed because of their size. View photos from my September microplastic collection. Last week, I once again explored under piles of Sargassum brought in with the fall tides, to find countless hidden pieces of microplastics. There are also larger pieces like bottle caps carried in on these tide. In a two mile stretch of beach on top of the wrack line, I found over a hundred bottle caps in one hour. The beach is beautiful at sunset this time of year. I sometimes wish I did not know about the hidden secrets of microplastics. In February, I gave a short presentation on microplastics at the GTM State of the Reserve.